Abyssinian is a short haired domestic cat breed that has been developed primarily in United Kingdom over the past couple of centuries. It is said to have been brought from Africa to England in the nineteenth century and bred selectively thereafter, though there is no conclusive supporting evidence in this regard. And even as experts consider the Abyssinian to be an ancient cat, there are conflicting opinions as regards its origin. Many believe it was a wild cat originally owing to similarities in its markings with the African Wild Cat. 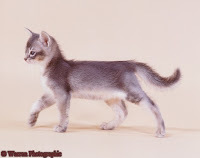 A medium sized sleek feline, the Abyssinian is a slender, yet muscular cat. Head is triangular with almond shaped expressive green or gold eyes and pointed ears. The long tail tapers at its end. Fur is short and bright with the most popular coloration being reddish brown, also referred to as 'Ruddy' or 'Usual'. Other colors and patterns include blue, cream, lilac, silver, tabby and tortoiseshell. 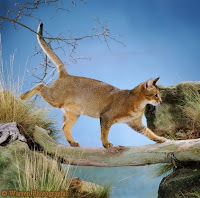 In general Abyssinians are very healthy and active cats. They often reportedly live beyond twenty years of age. As with other breeds, care of teeth is important as the cat ages. Occasionally Amyloidosis of kidneys occurs along some Abyssinian lines. Believed to be a hereditary ailment, it is not very common though. Playful and intelligent, Abyssinians are inquisitive cats. They are very fond of exploring everything and are always on the move in the house. Reported to be very understanding, these cats are affectionate and develop special bonds with their humans. They accept other pets readily too though some female Abyssinians are reported to be a bit edgy in this regard. 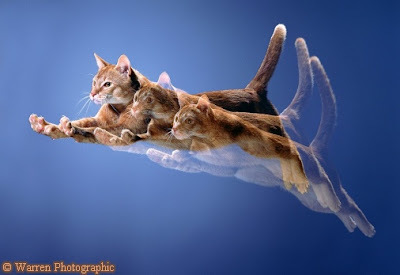 Athletic and active, the cats like to reach atop high places in the house and play with water. Other attributes include their loyalty and expressive nature. These elegant felines are objects of great beauty and admiration in many parts of the world. I own a black ticked Abyssinian named Harley. My neighbor found him at her mother-in-law's home where they were feeding him, thinking him to be a feral cat. Harley is a great cat. He is small but sturdy and he's a great hunter of mice and gophers. He is so loving. He pats me with his paw and he loves to hang out with me when I water. He is not fearful of water and doesn't mind getting wet. Recently he disappeared for 1 month and now appears to be fearful of people. He seems to be getting along better with my 3 other cats. He is not afraid of dogs but knows when to run away. He likes small children too. I was lucky that he chose me to be his person.